A company event can greatly benefit from the peace and quiet that a retreat on the water brings. Whether you need to get everybody back on the same track or get out of the daily routine and let inspiration flow, a ship, a sail and the horizon are great tools for the job. Depending on your needs, different ships may be available. How many huts would you need? Do your guests need a private hut? Do you need space for presentations, meetings or a band? We have ships suitable for all of that. We can even accommodate larger groups: if your group is over 35 people. you can spread them over several ships. Usually, our day trips start at 09.00 and end at 18.00. If you want to set sail early on your first morning, you can book an 'early arrival', meaning you arive on the night before the trip and spend the night on board. Spending the night and departing in the morning is also an option. 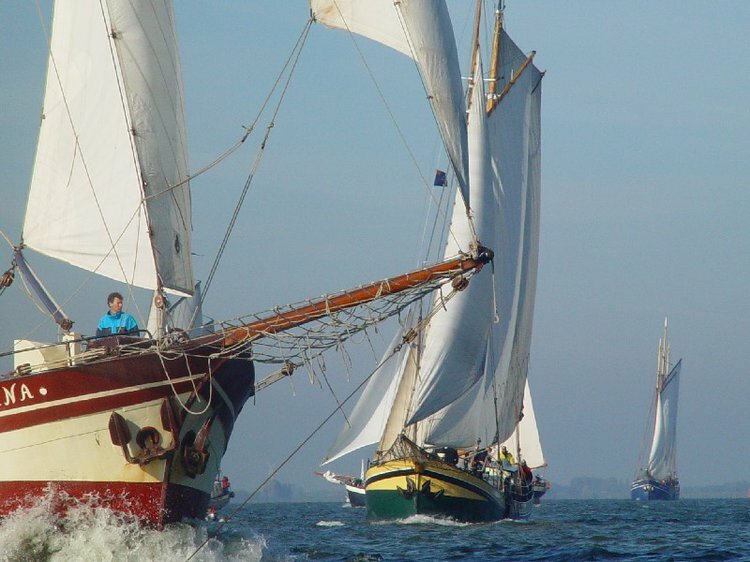 The IJsselmeer is the great lake between Friesland and North Holland. The harbour in Enkhuizen connects directly to the IJsselmeer. The Waddenzee and West Frisian Islands lie north of the Afsluitdijk. The harbour in Harlingen is connected to the Waddenzee. Most of our ships make port in Enkhuizen or Harlingen, some in Muiden. Longer trips, depending on the weather, may allow you to pass through the floodgates in the Afsluitdijk. That means you can sail onto the Waddenzee from the IJsselmeer out and vice versa. Sailing is an intense activity that will surely make you hungry. Fortunately, there's a kitchen on board! Self-catering is the default, but we offer several catering options to provide you with a bit of tasty luxury. Our extensive catering packages offer you options for breakfast, lunch and dinner. We'll accommodate to your wishes. You can go ashore for dinner, have dinner on board or maybe go for a tasty barbecue on the ship. Coffee, tea and a snack are available by default, but if you're more of a thirsty type: ask about our drinks-on-board offer. For groups over 20 people, we have a bus service to take you to and from the ship. Ask for our non-obligatory offer!